Are you in a search for the best blender for green smoothies? Well, this article might be a solid place to start your journey. Stick with me and I’ll do my best to tell you all I know about those green smoothies blenders. I love to be active; to work, to exercise, to travel, to meet new people, to go in nature, etc. But in order to do all that I need strength and vitamins. And what better way to get that than drinking green smoothies? After buying that blender, my life and health changed for the better. I am energized every day, my skin and hair are shiny and beautiful, and I have enough strength to work out on a daily basis. Guys, you know that my site is all about enjoying the food. But, I asked myself, why not take that to another level and treat your body and mind with a top notch blender? My goal is to help you find a good blender for you so that you can also live a healthy lifestyle. From benefits to top products, this article offers all relevant info on why each one of us should have a blender at their home. Now, it’s to get the best blender for green smoothies. Why should everyone have a blender? In case you’ve never used a blender for smoothies before, you should learn a thing or two about its benefits. So, let’s take a look at why you should buy a blender. Most of us are very picky when it comes to eating veggies and fruits. We don’t like this, we hate that, etc. Of course, we end up eating two or three kinds of fruits and veggies, while all of the rest falls into the category “Thanks, but I don’t want to eat that”. Just think about all those vitamins, minerals, and oxidants we’re saying “NO” to. The first benefit of having a blender is that it turns everything we dislike into something very delicious. When you consume a smoothie on a daily basis, you’ll have a plenty of energy and will be healthier. A smoothie is a vitamin bomb and has all our body needs in order to function properly. Mango, matcha, kiwi, spinach, orange, and banana – I mix everything that is in my fridge. Sometimes I also add almond milk to my smoothie, because it makes my smoothie that more delicious and healthier. If you want to try this, this article might help you. A blender will also come in handy if your kids don’t want to eat any fruit or vegetable. You can make them smoothies, and they can bring it to school and have a filling meal. Another benefit of having a smoothie at your home is you get to use whole fruits and veggies. That way, you won’t have to throw piles, which means more fibers and minerals for you. Also, when we use the whole food, the fibers slow down digestion. This means that smoothies can replace a meal because the energy is released evenly. That contributes to prevention of sugar highs and lows, thus you’ll feel full for two to four hours (depending on your body’s needs). Compared to juicers, which are very difficult to clean and cleaning takes a lot of time, cleaning a blender is a breeze. Also, check the video below for more tips when cleaning your blender. Here are some things to consider before buying a blender for you. Want to spend a fortune? First of all, decide how much money you want to spend on a blender. 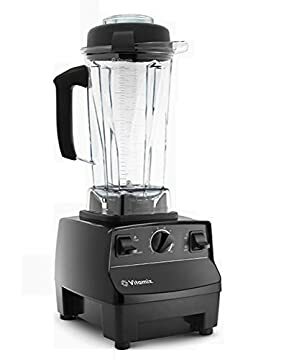 You can find a good blender under $150, but if you want to get a top notch blender you should consider buying the one which price goes up to $400. For how many people will you be making smoothies? Do you have a big family? Or you live on your own? Blenders that come with large jars are typically designed to blend larger batches. Then you have smaller (so-called personal) blenders, which are meant for making two-three servings in one go, thus they are ideal for one person. What’s more, you can drink from the same container in which you made your smoothie and take that container with you wherever you go. Do you have enough Space in your kitchen? You should definitely think about where you will store your blender. Do you have a smaller kitchen or a larger one? Obviously, if you don’t have much space in the kitchen, you’re going to need a smaller blender. Blenders are usually stored in a cabinet, cupboard or at the countertop. I keep mine on the countertop because I make smoothies every day and I need quick access to the blender. You don’t have to use your blender only for making smoothies. You could also use it for making butter, sauces, dips, etc. Therefore, consider whether you want a blender with additional features so that you can make all kinds of foods. Now that you know the benefits of blenders, let’s find the best green smoothie blender for you. According to our reviews, here are top picks for 2017. I firmly believe that we should invest in our health, and these blenders are a great way to do that. [gtrow][gtcolumn size=”6″] The Vitamix 5200 is one mean blender, designed with health in mind. It is powerful, fast, and has 64-ounce container. Because of all this, it is a good choice for big families, offices, and restaurants. Since the blender is powerful and precise, it will pulverize even small seeds. You can use it to make delicious smoothies, milk, soups, nut butter, frozen drinks, and ice creams. You will definitely have a lot of fun trying out various recipes with this quality blender. Most importantly, you’ll enjoy the flavorful taste of food. Another great feature of this blender is the adjustable speed. Thanks to this, you can choose the ideal texture of your smoothie. You can make it as thick and creamy as you want. In addition to all these features, the blender is easy to clean and you can clean it in a very short time. Bearing in mind the abilities of this blender, it’s not surprising that it is expensive. On the bright side, it’s unquestionably a wise investment and will last you for years to come. The Ninja Mega Kitchen System is a good choice for both restaurants and homes. 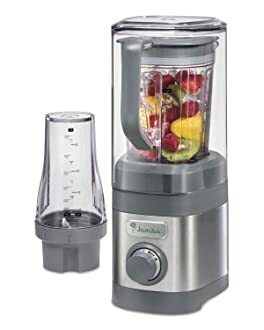 With 1500 Watts, and 72 ounce total crushing pitcher, this blender delivers amazing results in a very short time. It comes with a food processor bowl and two Nutri Ninja cups. Thanks to a powerful motor, the blender will handle nuts, veggies, fruits, and even ice. With this blender, you can quickly make your favorite green smoothies. What’s more, the blender has a large container which makes it a good choice for large gatherings. You can have your drink on the go because there are two 16 ounces cups. However, they don’t come with lids, so you’ll have to hold the cup all the time. When it comes to design, the combination of black and transparent is just delightful. 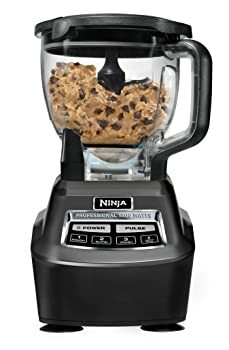 No doubt that this blender will be a stylish addition to your countertop. On the downside the blender is noisy. It is also big, hence may not be a good choice for small kitchens. [gtrow][gtcolumn size=”6″] If you make smoothies and protein shakes on a daily basis, this blender is just the thing you need. It’s quiet, fast, and takes up little space on the countertop. It comes with a recipe book, so you’ll get a plenty of inspiration to make nutrient and delicious food. Compared to the previous models on this list, this one is quieter. You’ll especially appreciate this feature if you have a toddler and don’t want to wake him up each time you make a smoothie. Powerful 1.6 peak HP motor makes smoothies that aren’t clumpy. You’ll fall in love with the creamy texture, and appetizing taste of green smoothies. Moreover, the blender is ideal for chopping ice, so you can also make frozen drinks. Jars are dishwasher safe, which makes cleaning a piece of cake. Because of its compact size, this blender is not suitable for larger batches. A slight concern is that it needs a few seconds to speed up. [gtrow][gtcolumn size=”6″] Whether you’re a student, businessman, teacher, or a fitness instructor, this blender might be just what you need. It’s trustworthy, reasonably priced and sturdy. 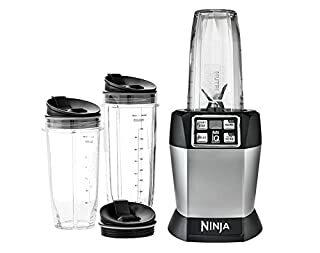 The blender comes with 1 jumbo multi-serve and 2 regular nutria ninja cups. 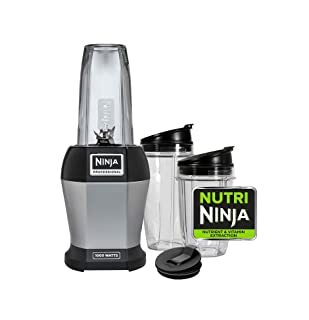 Thanks to Nutri Ninja Pro Extractor Blades, the blender is capable of blending ice, seeds, vegetables, and whole fruits. With this blender, you can quickly make wholesome meals and drinks, including green smoothies. Auto-iQ technology makes sure that you get well-prepared meals, without a need to check up on the blending process. In fact, this clever technology features programs that will do the thinking for you, so no more guesswork. Ninja cups with sip and seal lids are great if you want to have smoothies on the go. Moreover, the lids are reliable, so you won’t have to worry about spilling. Best of all, all parts are BPA free (safe) and can be washed in the dishwasher. So, cleaning the blender is an easy task. [gtrow][gtcolumn size=”6″] Whether you’re working hard, studying every night, or doing an intense training, this blender might be a good choice for you. It makes mouth-watering and rich smoothies, which will give you a kick of energy you so desperately need. The blender comes with a handy instruction book, so no need to worry if you will know how to use it. Because of a powerful motor, the blender delivers perfectly smooth drinks. You can add whole fruits, vegetables, seeds and ice – and this blender will cope with all of that. It fits nicely on the countertop, so if you live in a smaller apartment, you’ll definitely appreciate its size. What you’ll also love is that the blender comes with 2 convenient cups. They feature sip and seal lid, hence you can take the food on the go. With this blender, you won’t have to waste time on cleaning since blades and lids are dishwasher safe. Like the previous model on the list, this one is also loud. Another downside is that you’ll have to hold it down each time you use it. Well, that would be all from me guys. I really gave my best to help you find the best blender for green smoothies for you and your family. It’s time to get the most out of your life and it all starts with veggies and fruits. So, don’t be silly and spend money on all kinds of supplements, but rather buy a quality blender. It’s a long-term investment and you’ll enjoy its benefits every single day. Although all of the listed blenders have their own pros and cons, they are good options for living a healthy lifestyle. However, my favorite is Vitamix 5200 Series Blender. The Vitamix 5200 fits all my needs. It’s versatile, powerful, precise, and easy to clean. With this blender, I make frozen drinks for my friends, and me, in just one go. But, when I don’t want to use ice, I simply use cold water from my lovely water cooler. Let me know which blender in this list is the best one for you? Caffeine Pills vs Coffee: Which One Should You Take?